The MSC supports the ridge and two valleys for roof construction. Ideal for dormer roof applications. Simpson Strong-Tie gray paint. HDG available; contact Simpson Strong-Tie. Reminder: Hip and valley slopes are typically much different than roof slopes. See the online Slope and Skew Calculator for assistance in computing slopes and skews. The total design load of the hanger is split between the ridge (20%) and each valley (40%). MSC connectors can be used for two valley connections with no ridge member. Divide the total load by two for each valley load. 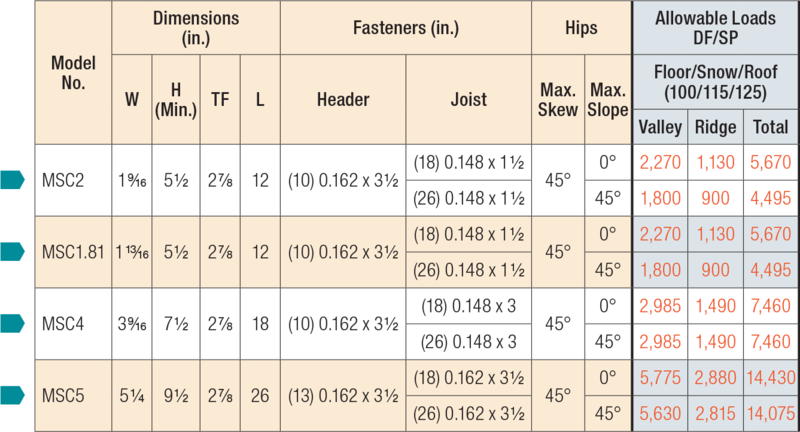 Hip/valley connections and many combinations of joist sizes, slopes and skews can be manufactured (refer to MSC Multiple Seat Connector Special Order Worksheet, T-MSC-WS). A special-order worksheet for the MSC multiple-seat connector. Valley loads are for each valley. Other valley-ridge load distributions are allowed, provided the load sum of all three carried members is distributed symmetrically about the center of the hanger and combined does not exceed the total load. MSC4 is also available in 3 1/8" glulam width. MSC5 is also available in widths up to 5 1/2". W2 minimum width is 3 1/8". MSC4 is also available in widths down to 1 9/16". Use 0.148" x 1 1/2" nails and MSC2 allowable loads. Refer to technical bulletin T-MSC-WS for the hip/valley rafter roof pitch conversion table.